Location, location, location...this restaurant has it in abundance. The Bayside Brasserie was one of the last restaurants to take occupancy in the Mermaid Quay complex, but the planners certainly saved the best spot for last, as there can be few restaurants that command such great views as this one does. 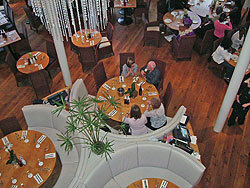 As you enter the Bayside Brasserie you notice that the floorplan is circular in design. Most of the tables are arranged around the floor's perimeter, so that diners can be seated near to the windows that offer such great views. These views extend from the Millennium Centre - right the way around the bay - to the St Davids Hotel, allowing you to take in most of Cardiff Bay's sights in one panoramic swoop. Of course you go to a restaurant to eat and not just to take in the views, but you needn't worry about the food, because it is equally impressive. Being a brasserie-style restaurant you are encouraged to take a walk up to the counter and inspect the offerings yourself. You can choose from a wide range of fresh fish, shellfish and meats. When you have spotted something you like, tell the chef and he will take your order. Then grab a bowl and wander over to the salad bar for something to accompany your main meal or simply to have as a starter. Our party ordered a variety of dishes including Lemon Sole, whole Sea Bass, Hake and Sirloin Steak. Each dish was correctly cooked to our individual preferences and was served with either new potatoes, jacket potatoes or chips. Everyone agreed that the food more than matched our expectations. We also enjoyed excellent service from some very friendly waiters and waitresses. Throughout the evening they went about their business with a helpful and friendly demeanor, which is often lacking in other restaurants. Another striking design feature of this restaurant is the upper landing area that looks down into the centre of the main restaurant. Hanging from the ceiling on this upper level is a huge glass chandelier that creates a very impressive focal point to the restaurant. The toilets are located on the upper level so you'll have ample excuse to go up and take a look at the view from the landing. I'd been waiting quite a while to try this restaurant, but it was definitely worth the wait and I'll certainly be going back again.